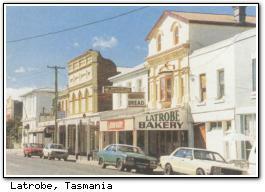 Latrobe (pop ~2600) is located on the Mersey River in north-west Tasmania, just south of Devonport. It is the site of several major festivals and events. The most famous event held at Latrobe is the Latrobe wheel, a cycling event with one of the largest purses in Australia. The wheel is held in conjunction with the Latrobe Gift footrace, around Christmas each year. Other events include Henley on the Mersey regatta (January), the Tasmanian Country Music Festival (March) and the Highland Games and pipe band competition (May). Latrobe and Spreyton are also centres for pacing in Tasmania. Latrobe once had its own shipyards, and many buildings are over one hundred years old, with some classified by the National Trust. To the south of the town is Henry Somerset Orchid Reserve, featuring native orchids and other flora. Prior to European settlement, the Latrobe area was home to one of the major Aboriginal tribes in Tasmania. It has one 4-star and one 3½-star bed & breakfast facility (RACT rated).